While budgeting never sounds as much fun as spending, approaching money management as a game can give energy to the task. We all want to have enough money to pay the bills and do the things we enjoy. Those are the natural consequences -- or the prizes -- that come from learning how to effectively save, spend and grow your money. Before you can begin saving, take inventory of what you spend your money on. You'll need to gather up your receipts, billing and credit card statements. There are two kinds of expenses: Those that are fixed and can't be changed such as the rent, and variable expenses that can be changed by you. To play Cut Back, Not Out, highlight the expenses you have some control over. Next, identify what you can do to cut back on those expenses without giving them up completely. Figure a realistic weekly savings goal. For example, bringing coffee in a thermos three times a week instead of going out can cut back your expense by $10 a week. According to Janet Kincaid, an FDIC senior consumer affairs officer, it’s easier to save if you know what you want and how much you need. To play Fill the Bucket, you will need a container such as a jar or pail, scissors and colored paper. Decorate your "bucket" with a label or a picture of what you want along with the dollar amount of the goal. Cut your paper into strips and mark them with dollar amounts. Next, set up an actual savings account with your financial institution and begin making regular deposits. Enter each deposit on the slip of colored paper and drop it into your actual bucket until the goal is fulfilled. Savings add up faster in an interest earning account. To compare the difference between saving with and without compound interest, play the Shoebox Saver game. You’ll need a calculator, pen, paper and a partner. 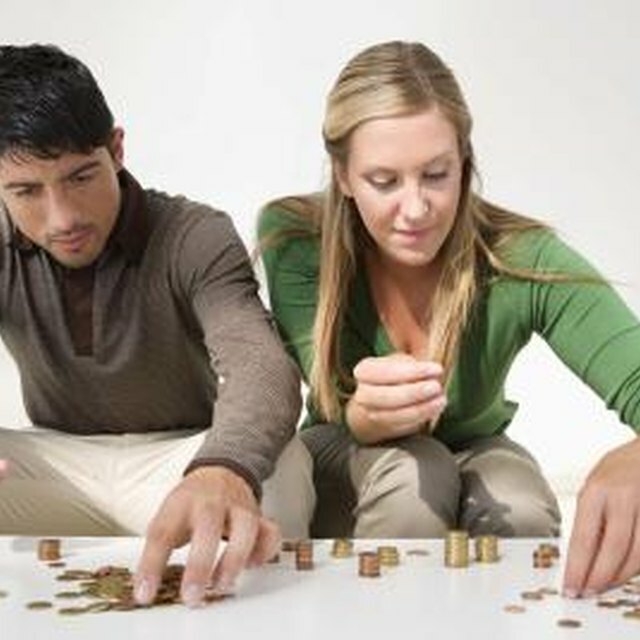 Each participant calculates his weekly savings for a period of one year, five years and 30 years. Participant A is the Shoebox Saver and earns no interest. Participant B is the Super Saver and calculates a 5 percent interest, compounded daily. For example, if both participants save $35 a week, in one year, participant A will have saved $1,825, and participant B, $1,871. After 30 years, compound interest will have really kicked in, with the Shoebox Saver earning a mere $54,750 as compared with the Super Saver at $127,077. Using envelopes can help you visualize and manage those everyday variable expenses with more control. You can use actual paper envelopes or virtual ones, with photos or labels to mark each one with a variable expense such as entertainment or eating out. Put a set dollar amount into each envelope to cover that expense for a set period of time. The rules of this game dictate that once that money is gone, it’s gone until the next pay cycle. You can move money in and out of other variable expense envelopes, but you can't dip into the savings bucket or use the credit card.